One of the Soviet Union’s leading composers – with some distinguished fellow composers a member of the so-called Armenian ‘Mighty Handful’ - Arno Babadjanian was admired by musicians of the stature of Shostakovich, Khachaturian, Rostropovich and David Oistrakh. He was an outstanding pianist and a very considerable virtuoso. Musically he explores his native Armenian folk tradition, and reveals the importance of the flair of his mentor Khachaturian’s colour-conscious orchestration. 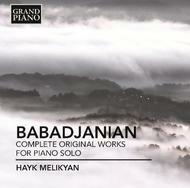 A laureate of many international piano competitions since 2000, Hayk Melikyan was awarded a Gold Medal by the Moscow Composers Union in 2012 for his contribution to the promotion of contemporary music. In 2013, he was awarded the distinguished title of Honorary Artist of the Republic of Armenia. He has given premières of numerous works by contemporary composers, several of which were written for him.